Get involved and make a difference! 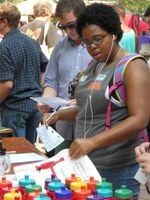 Come check out the many organizations on campus doing work to advance sustainability, including the Engage.Lead.Serve. Board's Green Initiatives Committee, GRASS - Group Recycling and Sustainable Solutions, UofL Habitat for Humanity, and many more!